Even if your baby still relies heavily on formula, there's room for food experimentation. 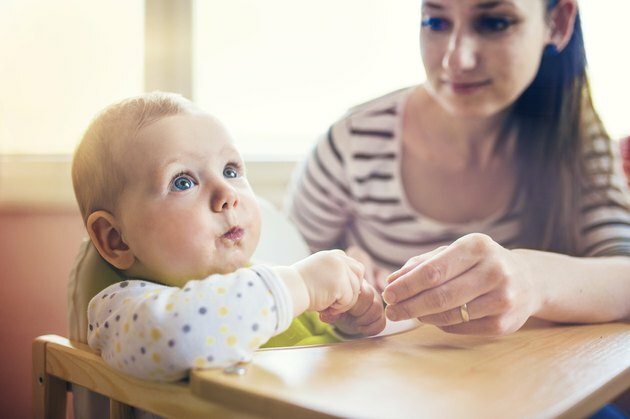 Babies can begin eating soft or pureed foods between 4 to 6 months of age and can graduate to more solids foods, like Gerber Puff Cereal, by around 8 to 12 months. If your baby shows the signs that he's ready for finger foods like cereal puffs, start him off slowly. The new shapes, textures and experience of self-feeding will help him develop new skills while he has a tasty treat. Evaluate your baby's readiness for solid foods. A baby should be between 8 and 12 months of age before you give her finger food, according to KidsHealth. She should have developed enough fine motor skills to pick up the food and feed it to herself. Feed your baby the Gerber puff cereal designed for his age and development. Test the cereal in your own mouth to make sure it melts when mixed with your saliva rather than requiring that you chew it up. This helps ensure your baby won't choke. Place your baby in a high chair or car seat to help prevent choking and to reinforce where you prefer your baby to eat. Offer your baby only a few pieces of the puff cereal at a time and supervise her reaction and ability to grind up and process the cereal with her tongue, teeth and gums. Never give puff cereal to a baby while unsupervised, especially if its her first time. Let your baby feed himself and offer help along the way, but resist the urge to feed it to him if he's having a tough time. Eventually he will catch. This helps foster fine motor skill development and independence. Feed only once per day, as your baby needs a wide variety of foods to thrive. Gerber Puff Cereal won't provide adequate nutrition if it replaces several servings of fruits, grains, vegetables or dairy.